Hi, My name is Katie Ireland and this is my daughter Charlotte. 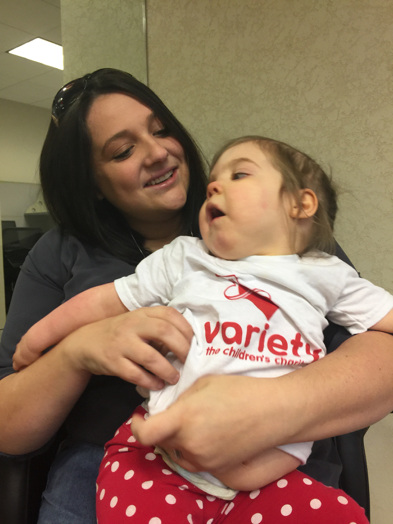 Charlotte falls into the category of special needs although we still lack an official diagnosis. The last two years have been full of painful genetic blood tests, an MRI, an EKG, an EEG, an EMG and a muscle biopsy – all without official results. All we really know is that she has severe low muscle tone and global developmental delays. The last two years have also been jam-packed with therapy and doctors’ appointments and even a therapeutic preschool. It has been rough. With very few silver linings. One positive change we have had in our family is adding a baby brother for Charlotte. 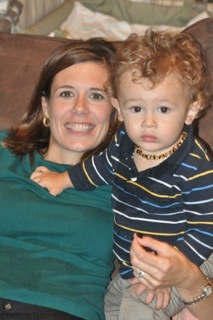 He is now 1 and is a ball of energy and shows no signs of whatever is causing our Charlotte to be delayed. As Max has grown, my husband and I really started noticing how little Charlotte is able to do with her brother and her peers. It has seemed like almost every toy and almost every park was made with only average needs kids in mind. We were beginning to be feel depressed and closed off. But something amazing happened. Our physical therapist at her preschool told us about the Go Baby Go! cars and she suggested we apply. Honestly I thought it was a long shot. But clearly, I did not know Variety yet. I filled out the application and a few weeks later I received a phone call from Deborah. And when I say she was excited to share the good news, that is a big understatement. She was ecstatic to be able to give our little family such an incredible gift and her excitement was felt tenfold in my husband and I. 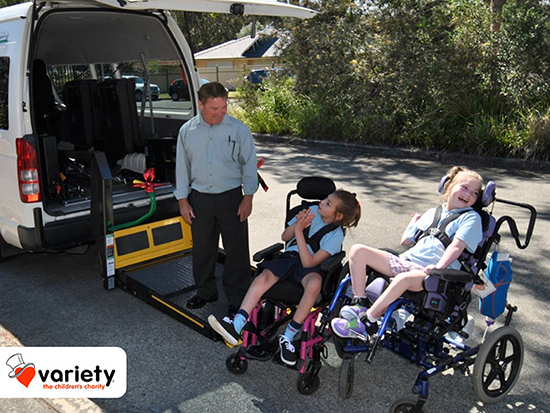 They, Variety Club and Rockhurst were going to personally adapt a car for our Charlotte. She was INCLUDED!! And not just her – 19 other toddlers were going to feel the same inclusion. A couple weeks later, we attended the Variety Club Halloween Party, and from that moment on I knew that we had found our silver lining! The next weekend was the build and we experienced pure pride as we watched our little “developmentally delayed” child drive that car with ease. And the smile on her face was worth the 2 years of tests and therapies and unknowns. Not only that, we were able to deliver a go baby go car to Charlotte’s best friend Mason who is also severely low tone but had a benefit in his honor on the day of the build. It was incredible. His parents and my husband and I were in tears at the gifts we had been given. Although my husband isn’t here today, I know he would join me in saying a BIG THANK YOU to all of you that contribute to Variety. YOU make inclusion happen for our children and you make life a whole lot happier for the children and their parents. Thank you!! “He’s pretty special,” said Jessica, describing the progress Alex has made so far. 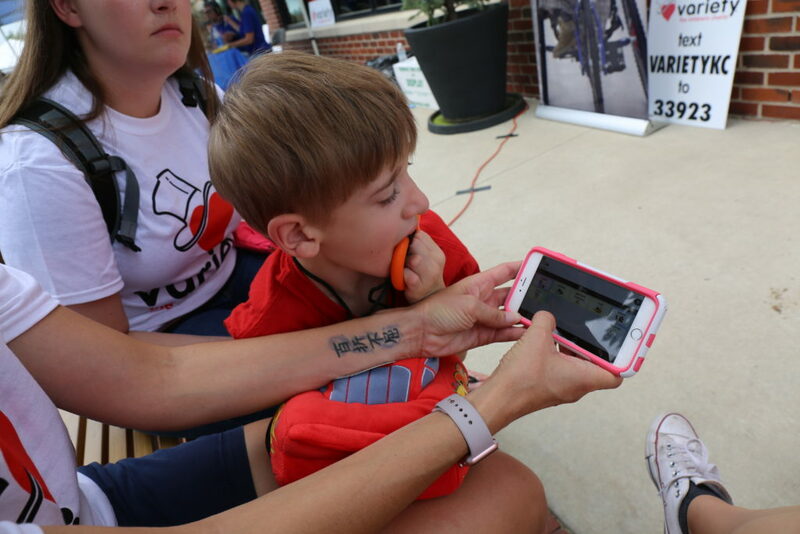 “He’s learning how to talk on an iPad, he’s learning how to walk independently, and if I could get him to eat without throwing food on the floor, it’d be amazing,” she said, smiling at her son. Alex uses an iPad with the ProLoQuo app provided by his school district to communicate with his family and teachers. The ProLoQuo software has pre-programmed phrases, such as “I want”. Then, Alex can choose from any number of cards; cards include actions (“play outside”, “swing”) or objects (“cookie”, “orange juice”). The program can be personalized by inputting photos of family members, teachers, and classmates for more complex relational sentences. After choosing a card, Alex can hit a button that prompts the app to say the phrase out loud (“I want to play outside”, for example). “That’s kind of where we’re stuck at school. He wants to touch every single button, so now we have to learn how to make it make sense,” explained Jessica, watching Alex enthusiastically tap all the cards on the screen. “He’s highly motivated by electronics. It’s a pretty neat program…it’s also $300.” The cost of an iPad combined with the $300 ProLoQuo software represents a sizeable cost. Before using an iPad, Alex learned to communicate using laminated paper cards. 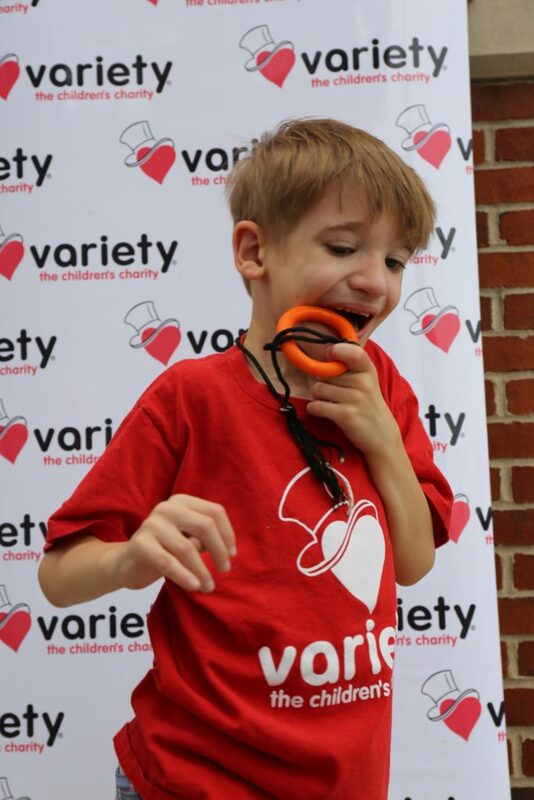 “He would pick the right card, but instead of giving it to the speech teacher, he would just try to eat it.” Alex broke the iPad he originally had at home, and Variety provided a tricycle for him last year, so Jessica hopes to apply for an iPad next year through Variety. 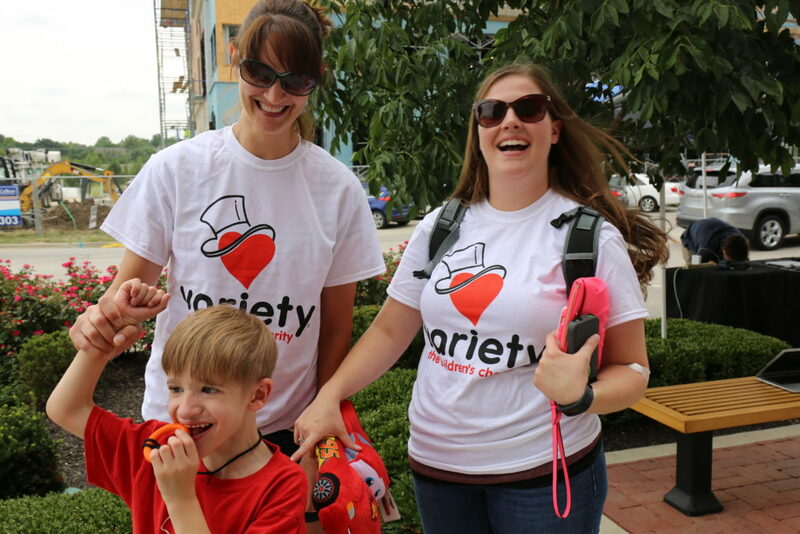 You can help us provide more gifts of communication and mobility by visiting www.varietykc.org. Pin a medal on my chest and mold an action figure in my likeness. I faced my fear. Today I walked calmly into a sunlit chapel and sat without expectation: I attended my son’s class’ telling of the Nativity Story. If you remember– and I don’t expect you do– last year’s ‘production’ left me emotionally wounded. My son Will– an exceptionally handsome, smart and kind 5-year old– happens to be autistic. 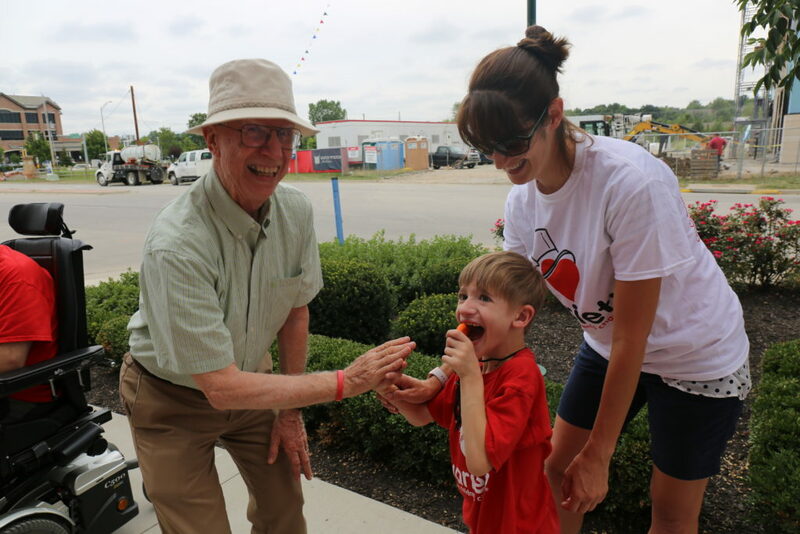 He attends a wonderful pre-K program with a classroom full of ‘typically developing’ children. Each year, the kids gather in an upstairs chapel to hear the story of Jesus’ birth. Then they pick a ‘part’, throw on a costume, and nonchalantly walk through the scene that changed the world forever. I don’t remember which role Will played last Christmas. I do remember heart breaking defeat. I remember holding back tears– and later sobs– as my child struggled to participate. I remember anger. Frustration. Jealousy. It took a lot for me to go back this year. Well, it really only took Will. I imagined that if he looked into the pews, and didn’t see me smiling at him, he’d unlock my dirty little secret… that it was hard to be his mom. I feared that with one glance, he’d realize that his father and I spend countless hours talking about his development. That until recently we’ve been fighting/resenting/wanting to erase autism. But if he saw me smiling– and yes, I practiced my fake smile so he might not see terrified tears– he’d know how much we love him. Perhaps he’d look back and understand that it took time, but his parents learned to embrace all of him. With his one-on-one teacher’s help, Will took a role as a shepherd (quite fitting: watchful men, quiet loners… not valued for their intelligence like the Wise Men… but smart enough to end up at the same spot as the Wise Men… the crib of Baby Jesus). The classroom teachers helped the othre kids put on their simple costumes. No one had a ‘speaking role’, unless Terri told them what to say. But when Will made his entrance, he exclaimed something to the effect of “You take it off!”. He tugged gently at his shepherd gear. But kept it on. He tried handing off his stuffed sheep (probably a big offense if you’re a real shepherd– but it filled me with a great joy). A few more times my Will tried getting out of this ‘play’… while it was happening. And for another year, Will made me hold back tears. But this time, tears of pure joy! He didn’t want to be in costume! And guess what? He was able to tell us!!! This ‘imaginary play’ didn’t make sense to him! And he was able to tell us!!! 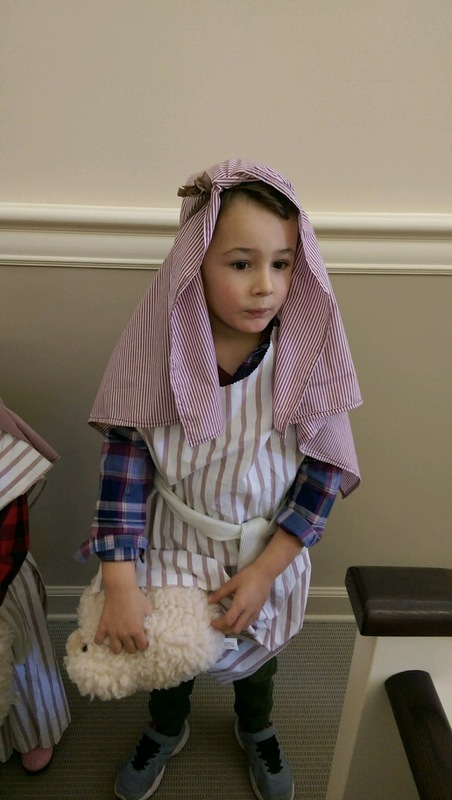 My five-year-old’s annoyance at being in a ‘Christmas play’ was the greatest gift from God. I’m sure others interpreted Will’s performance differently. But I saw a little boy being able to communicate his feelings. I understood that he had no idea why the rest of his class was wearing weird clothing and pretending to be enamored with a baby doll in a fake barn. I also understood that Will was able to follow directions long enough to keep on his costume and sit quietly. Will’s reward came within minutes, when Terri broke out her harpsichord. His body relaxed. The words– appropriate words that finally matched his peers’ words– appeared. “Away in a manger…” floated gently over the pews. If someday, Will, you should find my old writings, please consider this my Christmas card/ love letter to you. As you stood there today, annoyed and irritated, you made me love you even more than I thought possible. 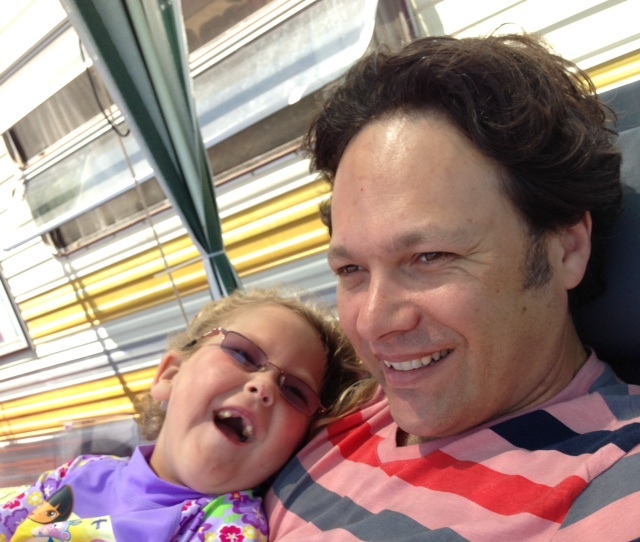 I have often contemplated if having a special needs kid makes for a special dad. I’d like to think so, but the truth is I still burp, need deodorant and annoy my wife, so it is likely that I am ordinary. But maybe that is what makes me special – the fact that I am ordinary. And we still wake up in the morning years later, shell-shocked, wondering if it is all a bad dream. I don’t think any dad of a special needs kid would profess a particular uniqueness, but we would describe an enlightenment that we have been awarded because we are on this journey. We know stuff, stuff we never thought would occupy our mind. None of us signed up for it, in fact if given the option I wouldn’t sign up for it again because I am weak – but I would never ever want to live life without my daughter, Sunny, just the way she is… Do you see the paradox? I sometimes see other dads and their kids playing and I feel this ache, like a heavy piece of lead has lodged in my heart, stopping the blood flow. It isn’t that I am jealous because I love my daughter; it is the constant reminder of what is not. The “what I have” is precious, the “what I don’t have” is simply unbearable. But when the alarm goes off in the morning, the world doesn’t wait and I am forced into the magnetic field that insists life moves on in the same direction despite the ache. I still have to go to work and contribute, which feels so odd when my parallel world seems like a different planet. I force myself to engage in incidental conversations in order to embrace the benign clockwork of life despite the sickening feeling of chaos – because I know if I don’t, I will drown in myself. So what does it feel like to be immersed in the normal when there is nothing normal about my life? Bloody weird. It feels like breathing water instead of air. I want ordinary but I don’t know how to be ordinary anymore. I guess that makes me special. Problem is I didn’t want special, I wanted the mundane, but I know myself well enough to know that if I had the privilege of mundane I wouldn’t even know how lucky I was. The irony is, for us to be truly aware of a privileged life, we have to experience the opposite and for our family, the “opposite experience” is not rewindable, it is permanent. So I reluctantly embrace the title of “special dad” because being an ordinary dad seems like bliss, and relief from that lead in my bloodstream would be nice. As for my daughter, oh God I love her – and I would poo poo this blog entry and dismiss it as blah blah because no philosophical evaluation will ever change what it feels like to hold my daughter Sunny and kiss her cheeks. This post originally appeared on JayMcNeill.com. There’s no way you’d spot us in a crowd. We don’t have a secret handshake. But somehow, special needs parents always manage to find each other. Maybe it’s that unmistakable look of exhaustion and resolve many of us wear. Whatever it is, I’ve been part of this family for 20 years. Even after all this time, I still sometimes stop myself and ask, “How in the world did I get here?” When my son was initially diagnosed with autism and epilepsy years ago, I didn’t know anyone else with a child like him. That was back in the dark ages, before the Internet. There were no websites or blogs to turn to for information and support. There was so much I didn’t know and so much I was desperate to learn; I could have used advice from a seasoned elder. Now I’m that mom. The one with some mileage on her. There’s no road map to navigate raising a child with special needs, but here are some pointers I wish I’d had when I first set out on this journey. 1. You are the expert on your child. No one else. Not your child’s doctor, his teacher, his neurologist and certainly not your Great Aunt Gussie who raised 10 kids of her own. Listen respectfully to them, but remember they are experts in their own spheres, not yours. All of them –therapists, family, friends — go home at the end of the day. You are in it for the long haul, and you know your child better than anyone. 2. You are parenting a person, not “treating” a cluster of “symptoms.” When your child is first diagnosed, you’re going to hear a lot about the deficits — all the things your child isn’t doing. Don’t lose sight of the fact that behind the “special needs” label there is the same wonderful child you had before the diagnosis, who needs your guidance and love. There’s a saying so popular in the autism community that it is practically a cliché: “Once you’ve met one person with autism, you’ve met one person with autism.” Your child is unique. Yes, you will get all caught up in searching out treatments and therapies, but please take the time to enjoy him right now, because he won’t be a child forever. Don’t let your fears of the future rob you of the pleasures of the present. 3. People will stare. This will eat at you in the beginning. It’s natural to feel uncomfortable, resentful, even mortified. It is also a natural instinct for people to look at anything that’s a little out of the ordinary. Your child’s quirky behaviors in public may draw attention, and what if they do? Stop worrying about it so much. Who cares what strangers think? And I can promise you this: You will learn to never, ever judge any other parent whose kid acts up in public. Eventually, you will figure out how to handle people’s inappropriate questions. I’ll never forget how taken aback I was at a wedding 15 years ago when my husband’s uncle abruptly asked, “Is there any hope for your son?” Sometimes, people may imply that you just aren’t trying hard enough. Or they will offer unsolicited advice or press the latest miracle cure on you. Worst of all, they will talk about your child right in front of him. Don’t let them. And don’t you do it either. Your child may not be verbal (yet), but his ears are working just fine. 4. Take care of yourself. Really. I’m not talking about a trip to Canyon Ranch. A study released a couple of years ago found that autism moms have stress levels similar to combat soldiers. I know there’s nothing you wouldn’t do for your child, but you count too, and you’re no good to anyone if you don’t stay healthy and strong. Physically and mentally. Medication is there for a reason. No, not for your child. For you. Don’t be afraid to ask for help if you need it. Because as all special needs parents know, we need to live forever. 5. You will meet some of the best people you never wanted to know. Other special needs parents will not only validate your feelings and prop you up, they’ll be your best source for information. They are the ones who really, really get it. Embrace those fellow travelers — they’re your lifeline. Especially the wise-cracking ones. Your sense of humor will save you. 6. You and your partner/spouse/significant other are a team. Your child has no one else who loves him more. No question, having a child with a disability is stressful, but it’s imperative that you work together. Feelings can run high; you may each react differently to the diagnosis or disagree on treatment. Don’t focus on what might have been; focus on what you have together. Check in with each other frequently; keep talking about what you are feeling and experiencing. 7. Focus on your other children. When a child is diagnosed with a significant developmental problem, it affects the life of every single person in the family. It can be a big adjustment for siblings. Find ways-frequently-to give them your undivided attention. Let them express the full range of their feelings, in their own words. 8. There will be people who tell you that autism is a gift. Or that God singled you out to be a special needs parent for a reason. Don’t believe them. You weren’t singled out or chosen. What you are doing is rising to meet challenges and simply doing what every good parent does: giving your child everything he needs to thrive. My son has many abilities and strengths; he can be warm and funny and empathetic; he has an amazing memory; he’s a whiz with video games. But I’m not going to lie: Those early years with him were hard and scary. So is reaching the age of 20. His disability isn’t a gift. What is a gift is the joy he and his older brother bring to our lives. 9. Celebrate your child’s achievements, regardless of how they stack up against those of siblings, peers, relatives, fuzzy memories of your own youth or dreams you may have had for your child before he was born. Because there will be many. We waited years to hear our son’s first sentence, and it was a gem: “Mommy, snuggle me.” Your child is going to surprise and delight you, and you will never take any of those hard-won milestones for granted. 10. You will learn with utter certainty what matters most. Parenting a child with special needs will teach you about patience. Humility. Determination. Resilience. Acceptance. You will love your precious, beautiful child more fiercely than you ever thought possible.